Here at Band on the Wall we do more than just concerts. 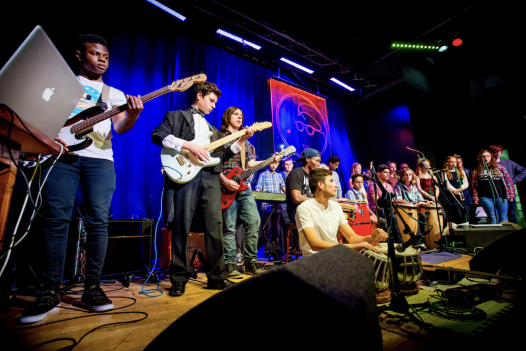 Year-round, we run classes and courses designed to nurture talent and promote hands-on learning in music. Our learning and participation programme has been designed to be inspiring, accessible and hands-on music learning experience. We offer a wide range of musical activities for all ages and tastes, suitable for everyone regardless of experience or ability. For those wanting a more formal learning experience, our accredited courses delivered by the Manchester College offer a unique opportunity to develop your skills and gain the qualifications needed to help kickstart a career in the music industry. Explore our current programme below. Whether you want to perform with a live band in an iconic venue, or sing solo on the West End, this course is a great place to begin. For anyone that’s new to music technology and wants to know what it’s all about, this introduction to the industry will help you get a really good grounding in professional music production. Learn how to produce house, hip-hop, techno, drum and bass, dubstep, grime and R'n'B to a professional level.